Gas prices across the country are at an average of $2.85 a gallon, which is the lowest cost for the entire year and down 43 cents from this time last year. According to AAA, travelers should anticipate more traffic on the roads as the Thanksgiving holiday approaches. AAA estimates that nearly 46.3 million people will travel a distance of at least 50 miles from home over the Thanksgiving weekend, Wednesday, Nov. 26 through Sunday, Nov. 30. This is a 4.2 percent increase from last year and the highest anticipated volume since 2007. 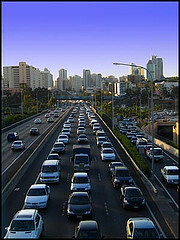 According to AAA, around 90 percent of those travelling for the Thanksgiving holiday will do so by automobile. In accordance with that, Thanksgiving air travel is also expected to be at the highest level since 2007, with 3.55 million people flying. Those who are driving to get to their Thanksgiving destination should plan their time out properly. It is estimated that it will take at least 25 percent longer to get to your final stop. In fact, Wednesday pre-Thanksgiving rush hour is expected to begin about two hours earlier than on a typical Wednesday. The worst delays are expected to occur between 2 p.m. and 5 p.m. The National Safety Council expects 418 people will be killed during the Thanksgiving holiday and another 44,700 seriously injured. The best thing that you can do to protect yourself and those you love is to buckle up. Check to see that your vehicle is in proper working order. Make sure you have a full tank of gas, check the tire air pressure and make sure the windshield fluid is full. Always wear a seatbelt and follow the speed limit. Stay well-rested so that you can be alert behind the wheel. Exercise caution in construction areas and work zones. Avoid distractions – do not text and drive, refrain from calling or receiving phone calls and always pay attention to the road. Take a break. Long trips may require you to stop frequently or even switch drivers. Keep an emergency preparedness kit inside the vehicle with useful items, such as water, snacks, a flashlight, first aid kit, extra cash and blankets. The Tampa Bay Injury Lawyers at Whittel & Melton want you to have a safe and happy Thanksgiving. If you happen to be involved in an auto accident, please call us to discuss your legal rights and options. We will be available around the clock to answer all of your questions. You can call us locally at 813-221-3200 or toll-free at 866-608-5529 or contact us online.